Over the course of a career that has spanned nearly two decades and 25 films, both short and feature, filmmaker Guy Maddin has provided his viewers with more than their fair share of unique, cinematic moments. To provide just one example, in Tales from the Gimli Hospital (1988), his first feature film, the audience is allowed to watch as one of the director’s many eccentric characters, a male who is attempting to make himself more attractive to the ladies relaxing on a nearby beach, disappears behind a dilapidated building, troubled that his hair is dry and in such a mess. At this point, the audience may expect that some grooming is in order, but most first time viewers could never predict how such a grooming process will eventually unfold. Out of sight from the women, the character manages to find a shiny, dead fish, which he then squeezes frantically over his head, until its guts are wretched open, spilling fish oil all over the man’s hair. The character soon reemerges, hair slicked back and full of fish oil. He is now ready to properly swoon the ladies still lying on the sands of Gimli beach. Keeping such a distinct image of a fish in mind, it may be appropriate to consider the career of Maddin in relation to the old cliché about the size of a fish as being relative to the size of the pond that it lives in. In the pond of the Manitoba film industry, he is easily the biggest fish there is. 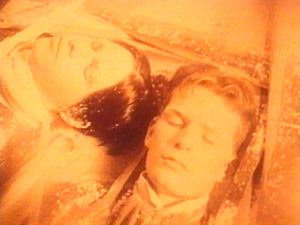 Since making his first short in 1986, titled The Dead Father, Maddin’s reputation has, for the most part, only continued to grow with each subsequent project. The fact that he has remained a resident of his hometown, the provincial capital of Winnipeg, throughout his entire life, has only added to his recognition as a Manitoba filmmaker. Within the pond that is the Canadian film industry, Maddin as fish becomes a bit smaller, having to make room for bigger fish that arrived before him, such as David Cronenberg as well as filmmakers that emerged on the scene at around the same time as Maddin, but have perhaps managed to achieve more far reaching success, at least in their attempts to capture both an international audience, as well as international, critical recognition. Atom Egoyan would be the most obvious example of a successful contemporary director who lives and works in Canada, but whose recognition extends well beyond Canada’s borders. That said, Maddin’s exposure has grown considerably in the past few years. In 2000, as part of the Toronto Film Festival’s twentieth anniversary celebration, 20 Canadian filmmakers, including Maddin, Cronenberg, and Egoyan, were each commissioned to make a short film. The resulting twenty shorts randomly played before feature films throughout the entire festival. By the festival’s conclusion, Maddin’s short, titled The Heart of the World, a six minute, furiously edited, black-and-white masterpiece, was considered by many festival goers and critics to have been not only the best short to play at that year’s festival, but to have been the best film of any length to play during the entire festival run. Since the release of The Heart of the World, he has continued to work steadily, completing several short films, as well as a pair of feature films, one of which is to be released later this year. Co-written by Maddin’s long-time writing partner, George Toles, as well as Kazuo Ishiguro, Booker Prize winning author of The Remains of the Day, The Saddest Music in the World (2003), may well turn out to be the film that shows the world what many Manitobans and Canadians, as well as several cinephiles and professional film critics from around the world, have already known for years: that Guy Maddin is one of the most original, important filmmakers working today, regardless of geography or genre. When Maddin was still a young boy, his older brother committed suicide, and while he does not often talk about it, suicide has certainly become a prominent theme that runs throughout his body of work. For that matter, fathers with missing eyes also frequently appear as characters in Maddin’s films, and so, no matter how fictional and exotic the director’s landscapes may seem, they are often fused with pieces of his own autobiographical history. After graduating with a degree in economics from the University of Winnipeg, Maddin worked as both a bank teller, as well as a house painter, while meeting people whose friendships would serve him well, especially in terms of being able to eventually get his first films made and distributed. As fellow Winnipeg filmmaker, John Paizs, tells it, Maddin and himself would spend entire weekends at the house of fellow friend Steve Snyder, before any sort of formal film school existed in Winnipeg, and would watch hours upon hours of films on videotape and 16mm projection. (2) Eventually, Paizs would go on to make several excellent short and feature films of his own (Springtime in Greenland , Crimewave ), while Snyder would go on to teach film studies as a professor in what would eventually become the University of Manitoba’s film studies department. Even as Maddin was watching his friends make and teach about films, he had yet to make any sort of film on his own. However, in 1985, with the creation of a cable access television show, titled Survival!, in which Maddin played a character named “Concerned Citizen Stan”, while acting alongside his eventual producing partner, roommate, and friend, Greg Klymkiw, the seeds of his creativity began to show some definite signs of life. That same year, Steve Snyder, after screening several shorts that he had made while attending a filmmaking school in San Francisco, California, told Maddin that with the right equipment, he too could make a film just like the ones he had just seen. And so, Maddin finally decided that it was time to write and direct a film that he could call his very own. 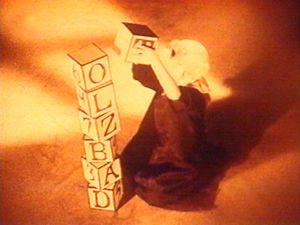 The resulting film, a 26 minute short, titled The Dead Father, is by far Maddin’s clunkiest work, in terms of both technical prowess and narrative smoothness, and yet, at the same time, the film does not come across as the work of someone who had never written a screenplay or touched a camera before making it. In fact, with his first film, he managed to lay down the framework for so much of what would become his later, consistent style. In The Dead Father, he reveals an obsession with black-and-white cinematography, an interest in opening his films with a series of constantly moving shots—a technique that he has continued to employ in several of his subsequent works—as well as the use of only a singular light source to illuminate his shots. Maddin has actually said that the rationale behind many of these choices is quite simple. By repeatedly opening his films with a moving camera, he easily gets the viewer’s attention from the first shot of the film. 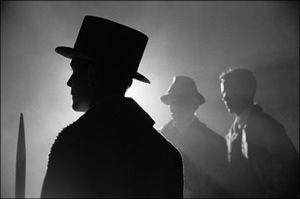 As far as lighting is concerned, Maddin has admitted that while he tried to use the traditional three-key lighting set-up that so many first time filmmakers read about in technical handbooks, while making his first film, all that he would end up with were three shadows of one nose on each actor’s face. (3) Since then, he has employed a single light source technique in most of his films, or at least the illusion of a single light source. Maddin’s interest in allowing obvious mistakes, such as errors in continuity or film equipment appearing in the background of a shot, made its way into The Dead Father, but has since become just another element of his films’ overall aesthetics. One could argue that such errors in The Dead Father are nothing more than the sign of an amateur filmmaker who didn’t know any better than to exclude such mistakes, and while this argument may be valid, one cannot deny that Maddin has fully embraced the artifice of film in his many works since, by choosing to intentionally include obvious mistakes within his finished films, merging abandoned light stands and motionless props that move whenever a cut occurs, with an overall presentation that is both polished and professional. That said, the mistakes in Maddin’s first film do not seem to be built in, or intentional. Instead, The Dead Father straddles the line between extreme, raw originality, and a lack of experience that makes the film inconsistent in pace, and unfocused in attempting to clearly convey what Maddin’s obvious, original intentions had been for his first ever project. The film’s general narrative centers around a father who has died in the physical sense, but just won’t stop haunting the daydreams and nightmares of his still-living son. In Maddin’s own words, the film’s premiere was a nerve-wracking affair, and yet was also entirely worth it, because it ended up garnering what would eventually become one of the most important relationships of his professional career, when a gushing amount of praise for the film emerged from the man who would eventually become his permanent screenwriting partner. Wisely, Maddin took his time while making Tales from the Gimli Hospital. More than 18 months passed between the writing of the film, the shooting of the film, and the eventual post-production and distribution on the film, but by all accounts, the resulting work made it worth it. With his first feature, not only did Maddin realize his goal of standing out as a unique voice within the Manitoba film industry, as well as an especially unique member of The Winnipeg Film Group, an arts co-operative that had gotten Paizs’ career started a few years before Maddin’s, but he also managed to find an enthusiastic audience waiting in New York’s underground film scene, thanks in large part to the help of Greg Klymkiw, who immediately saw cult potential for the film. And so, Tales from the Gimli Hospital would play for years in New York City, as pockets of cinephiles anticipated what Maddin would do next. Two years later, Maddin would release his second feature film, Archangel (1990), but already at this point in Maddin’s career, it was clear that the filmmaker was as interested in the short film form as in making feature films. 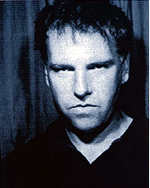 Unlike many other filmmakers, who use short films or music videos as a stepping stone, or proving ground, before making the permanent leap into feature filmmaking, Maddin has constantly worked in both mediums, and since 1986, he has averaged one short film per year, despite having long since moved into the realm of feature filmmaking. Maddin’s only documentary to date, titled BBB (1990) centers around the question of why certain hairstyles appeal to middle-aged, middle class women, and to seemingly no one else. The film is only 12 minutes long, but in those 12 minutes, Maddin manages to satisfy his craving for decayed film footage, by using worn-out home movies within the film. Archangel is the melodramatic story of a love triangle, set in Russia during World War I. The film’s title refers to a place in which the film’s one-legged soldier, Lt. John Boles, finds himself, as he attempts to aid the White Russians in the Arctic, while being dragged further and further into a love nest of mistaken identities and broken hearts. 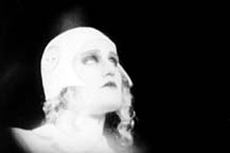 With this film, Maddin solidified his obsession with merging melodramatic, silent cinema of the 1920s with the several ways in which these films have aged in the many decades since. By intentionally incorporating crackling soundtracks and loops of audio hum, as well as unnatural breaks in the film’s action—achieved by removing pieces of film from a completed shot, and then splicing the remaining film back together—Maddin’s film appears at once a genuine relic of the 1920s, having survived countless screenings over several decades, and yet at the same time, he infuses an ironic, late-twentieth century sensibility into the presentation of narrative, as well as the film’s intentional signs of aging, in a way that constantly reminds the viewer that what they are watching fully belongs in neither the past nor the present, but seems to exist in a sort of limbo state, as a hybrid of elements, a decaying past made unnaturally fresh again. In terms of artificiality, perhaps the most ironic element of Maddin’s work is that in order for a film to become physically aged, with splices and a decaying soundtrack revealing such wear and tear, the film has to play over and over again, to crowds of people that just can’t get enough of it, and for years. By Maddin’s own admission, his films have never been designed for mass appeal, and so, one cannot help but wonder if the artificial signs of aging that he builds into his film will ever be joined by many actual signs of aging, from having been screened repeatedly in the decades to come. With the release of Careful (1992), Maddin managed to impressively release his third feature in just six years. Careful is the story of an alpine village called Tolzbad, in which the villagers must forever speak quietly, out of fear that a loud voice might cause an avalanche and crush the entire village. In the film, several dominant themes that were already so much a part of Maddin’s earlier work, continue to emerge. The obvious theme of an unsettled paternal relationship between fathers and sons is a dominant theme yet again, as is the presence of a one-eyed father figure. Of course, a one-eyed man could be considered to be as much an element of Maddin’s own autobiography as it is a metaphor for a moviemaker himself. A film director is constantly looking through his lens, in an attempt to see the world in the same way that a camera sees the world and projector presents a finished film to the world: two-dimensionally. As well, the theme of a split existing between masculine and feminine, to the point of males and females being outright terrified of one another, also makes its way into the plot of Careful, and one cannot help but wonder how the masculine/feminine split, so present in Maddin’s upbringing, would affect his eventual work. Having a father who coaches a hockey team, constantly surrounded by manly men doing manly things while at the arena, is about as masculine a scenario as one could expect to find oneself in. The contrast of having a mother who runs a beauty salon, and being surrounded by hair products and women having their hair, nails, and faces done up to look as womanly as possible, could only have creating a sexual counterpoint, which emphasized the contrast between the hyper-male and hyper-female worlds that Maddin grew up in. In terms of locating the emotional content within Maddin’s films, an impatient viewer may be inclined to conclude that these works are frequently devoid of emotion, or at least, that any genuine emotional content is hidden so deep beneath elements of irony, pastiche, visual style, and eccentricity, that a viewer may be wasting their time in attempting to locate emotion at all. However, while the link may not seem immediately obvious, I would be inclined to argue that Maddin’s work shares a great deal with Wes Anderson’s The Royal Tenenbaums (2001), especially in terms of locating emotion within each director’s primary characters. Like The Royal Tenenbaums, Careful begins with an extended prologue, in order to set the tone of the story, as well as to explain who is who within the ensemble cast of players. As well, both films embrace the use of hyper-stylized settings and costumes, which critics of both films have criticized as being an exploitive device, designed to conceal the potential emotional content of each film. However, if a viewer is willing to show some patience with both the work of Maddin, as well as with Anderson’s latest work, then they will eventually be rewarded with not only a subtle release of emotion by character, but they will also be exposed to a rarity in many contemporary films: an exploration of how emotions become so often improperly expressed, or outright blocked, whenever human situations become seemingly too complicated to handle. While both Archangel and Careful would play at a number of prominent film festivals and win several major critical awards, culminating with Maddin becoming the youngest recipient ever of the Telluride Film Festival’s Lifetime Achievement Award in 1995, the director has maintained that his biggest honour to date has been Careful‘s screening in Paris as part of the hundredth anniversary celebration of the birth of cinema, which also took place in 1995. And while Maddin seemed to be on a roll in the mid-’90s, especially after the release of Careful, the remainder of the decade proved to be a frustrating creative period for the director, to the point that he was ready to quit filmmaking at several different points, and could just not seem to get the kind of films he wanted to make off of the ground. Maddin and Toles completed a script titled The Dikemaster’s Daughter, which was to be set in nineteenth century Holland, or a fictitious Winnipeg, depending on which source material you read. The story revolves around a community comprising of dike builders, who must co-exist with the members of an opera company. 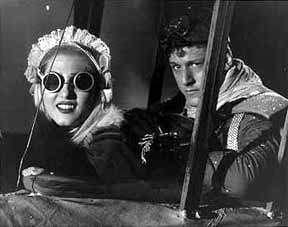 The Dikemaster’s Daughter was to be Maddin’s follow-up to Careful, and would have been his fourth feature film, overall. At any rate, the project was in pre-production when one of the film’s major sources of funding decided that they did not want to be a part of the film, and pulled out of the project, taking nearly half of the budget with them. (6) As a result, Maddin was left empty handed, with no prospects on the horizons. It wouldn’t be until nearly five years later, in 1997, that he would complete another feature film, despite having continued to refine his filmmaking skills by making a number of short films in the five year hiatus. 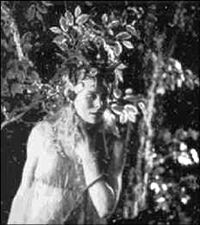 Twilight of the Ice Nymphs (1997) was to be Maddin’s triumphant return to feature filmmaking. The script was ready, he had a cast of actors more well-known than any actors he had worked with before (Shelley Duvall, of Kubrick’s The Shining (1980) and Altman’s Popeye (1980), as well as Frank Gorshin, of camp fame from playing The Riddler on the 1960s Batman television series), and all with a larger budget than he had ever known before. The plot revolves again around a love story, and a man returning home to a land where the sun never stops shining, and yet, while the film contains several elements that are pure Maddin, it just cannot sustain itself for its 90 minute length. In many ways, the film feels compromised, an indication that Maddin’s fervent imagination and creative independence were not a match made in heaven to distributors handing over a great deal of money to him, with the expectation that at least a semi-marketable movie would result. Through compromise, neither party ended up being satisfied, and the resulting work was Maddin’s least satisfying feature film to date. Of note, one of the most positive elements of Twilight of the Ice Nymphs is the picture’s use of colour, a sort of photocopied pastel look that is no doubt an influence of having grown up in a beauty salon. One cannot help but be reminded of the gawdy surroundings that make up the typical salon, especially from the 1950s and 1960s, when Maddin would have grown up. If Maddin’s father’s poked out eye provided the lifelong metaphor of a filmmaker constantly seeing the world through one eye, then his mother surely provided her son with a taste what goes on in the preparation for making a film, with little Guy Maddin constantly seeing women in costume, being made up for the world to see. Thankfully, Maddin did manage to emerge from the pits of the Twilight experience. While he ended up taking a few years off to teach filmmaking at The University of Manitoba, all the while pondering whether or not he was actually finished with filmmaking for good, he would eventually be inspired and reinvigorated by the work of a young, talented filmmaker named deco dawson, who happened to take Maddin’s filmmaking class, without ever having made a film before, and impressed Maddin so much with his first-time efforts, that he actually struck up a friendship with him outside of class. (7) Dawson, only in his early twenties, would become obsessed with Maddin’s filmmaking style, making films of his own that were at once homages to what Maddin had already accomplished, while being totally original, black-and-white, 8mm works that stood up completely on their own. 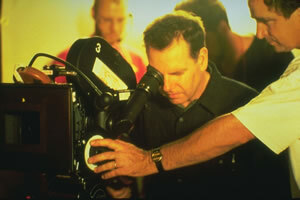 In the years since having taken the filmmaking class with Maddin, dawson has gone on to become a sort of filmmaking partner/pupil to Maddin, having co-edited The Heart of the World, while aiding in the shooting and editing of Dracula: Pages from a Virgin’s Diary (2001), Maddin’s first feature film since Twilight of the Ice Nymphs. With Maddin back on track with The Heart of the World, Dracula: Pages from a Virgin’s Diary was his official return to feature filmmaking. The Bram Stoker character, which has been used on film to the point of overuse, was given new life, as the director recruited the Royal Winnipeg Ballet, in order to tell the story of Dracula in the way that he imagined it should be told. In the film, various grainy types of film are frequently mixed together with beautiful, sparse lighting, creating extraordinary results. If Dracula verifies anything about the Maddin aesthetic, it is that he is especially fond of taking something that he loves, whether it be a story that has been told so many times before, as is the case with Dracula, or even an actor that he loved as a child, such as Frank Gorshin, and then repackaging it completely, in order to point out the decay that naturally takes place to everything, over time. That Gorshin was once a young star, but is much older and forgotten now, or that Maddin continues to employ intentional splices and audio crackles into his films, as if they belong side by side with the decaying prints of original prints from the 1920s, indicates that he is as interested in how we can learn to love how things and people fade, as much as we love the things and people themselves. Up to this point, most pieces written on Maddin seem to have built into them the subtext that while very few people have heard of him, more people need to hear about him. Indeed, after several failed attempts at making the feature film that will catapult him, if not to stardom, then at least to the next level of success in the world of experimental and independent film, The Saddest Music in the World may finally be the film to do it. Maddin’s casting of this film is more accessible than ever before (Isabella Rossellini and Mark McKinney, of Kids in the Hall fame, star), as is, perhaps, the plot. The film surrounds a competition in which all of the countries of the world have a musical competition, in order to determine which country’s music is the saddest, and therefore, which country has the right to claim the saddest history of any nation. With his latest film, Maddin will most certainly continue to explore his interest in music and sound, which has always been present in the ambient sound mix on the soundtrack to his films, as well as within the narratives of several of his works, most obviously Careful, with the townspeople that must barely make a sound when they speak, so as not to cause an avalanche, as well as the never realized The Dikemaster’s Daughter, which would have involved a major subplot involving the members of an opera company. Coming off the back-to-back-to-back success of The Heart of the World, Dracula: Pages from a Virgin’s Diary, as well as Cowards Bend The Knee (2003), a film/art instillation that has played to rave reviews around the world, Maddin’s yet to be released latest project promises to at least satisfy existing fans of his work, while recruiting some new fans along the way (8). Most importantly of all, The Saddest Music in the World promises to demonstrate a filmmaker working at his peak, and will hopefully continue to push the borders of a genre that Maddin invented himself, a genre that is at once beyond definition, and yet all too familiar to those already familiar with the director’s past works. DVD reviews and images from Tales From the Gimli Hospital and Careful. A selection of news articles on Maddin. Brief profile of his work with several links. Maddin’s films can also be bought here. The Bing Crosby reference is from Guy Maddin’s biography page on http://www.imdb.com. The ghost reference is from an interview segment in Guy Maddin: Waiting for Twilight, directed by Noam Gonick. Information on Maddin’s childhood is provided in Caelum Vatnsdal, Kino Delirium: the Films of Guy Maddin, pp. 17–26. John Paizs reveals this information during an interview segment in the documentary by Gonick. Guy Maddin discusses lighting techniques in The Dead Father during an interview segment in the documentary by Gonick. Deco dawson is the stage name of Darryl Kinaschuk, a Winnipeg playwright and filmmaker, who, in just three years, has managed to make a number of experimental 8mm films, that have played to acclaim at art crowds across North America and Europe. At the age of 22, dawson won The Best Canadian short film award at the 2001 Toronto Film Festival, for film (dzama), a short film based loosely on the life of Winnipeg artist Marcel Dzama.